Today marks a special day in our history. 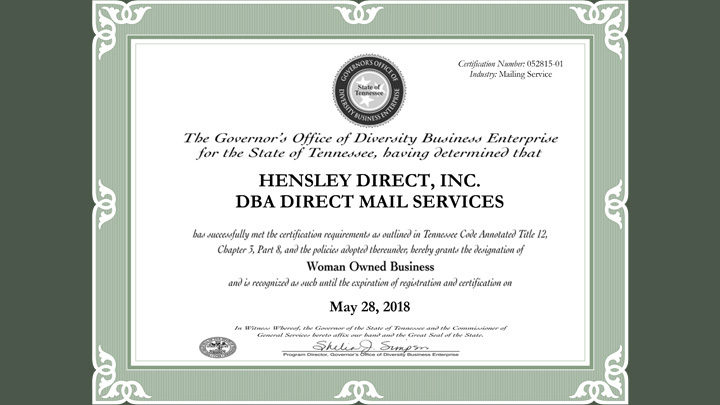 Not only have we been serving East Tennessee for 29 years, but we were also informed that Direct Mail Services has been certified as a Women Business Enterprise (WBE) by The Governor’s Office of Diversity Business Enterprise. We are now listed in the Go-DBE Certified Business Directory as a Women Business Enterprise. We are excited about our future as we expand to offer new services with brand new technology and equipment. Contact us to find out more about new ways Direct Mail Services will be able to save you time and money with your business mail.